ThermoPEX is flexible, pre-insulated piping consisting of two waterproof oxygen barrier PEX lines (supply and return) protected by polyurethane closed cell foam insulation and a thick, durable, waterproof polyethylene outer jacket. The Central Boiler-specific corrugated outer shell allows for tighter turns. 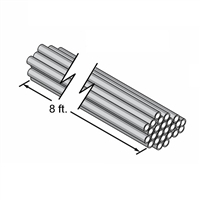 It is the ideal insulated piping for use with outdoor wood furnaces. ThermoPEX with 1" PEX line is sold by the foot in five foot increments. Volume discounts for lengths over 100'. Note: 1" is the outside diameter of the encased PEX lines. Inside diameter is 3/4". Fits snugly over each end to protect and seal the insulation from water. Includes band clamps. ThermoPEX Coupling Kit - 1"
Deburs pipe and used to mark pipe to indicate when the pipe is inserted completely into the fitting. One tool for 1/2", 3/4" and 1" pipe. Twelve-inch rubber splice is used to join two ends of ThermoPEX together. Includes band clamps. Fittings and crimp rings for joining the PEX lines are sold separately. For splicing 1" PEX, see part number 1333. ThermoPEX Coupling Kit - 1-1/4"
Twelve-inch rubber splice is used to join two ends of ThermoPEX together. Includes band clamps. Fittings and crimp rings for joining the PEX lines are sold separtely. For splicing 1-1/4" PEX, see part number 381. Central PEX 1" pipe in 8-ft straight sections, includes 10 sections per bag. (25 per bag also available, part number 5700083). Central PEX 1" Pipe is a high-density, non-oxygen barrier, cross-link pipe, rated for temperatures to 180°F at 100 psi. Note that the color has changed from green to red. High-density, oxygen barrier, cross-link pipe. Rated for temperatures to 180°F at 100 psi. Excellent for radiant floor heating applications. Central PEX 1" Pipe is a high-density, non-oxygen barrier, cross-link pipe, rated for temperatures to 180°F at 100 psi. Note that the color has changed from green to red. Central PEX 1" pipe in 8-ft straight sections, includes 25 sections per bag. (10 per bag also available, part number 5700082). High-density, oxygen barrier, cross-link pipe. Rated for temperatures to 180°F at 100 psi. Excellent for radiant floor heating applications. Central PEX 1" Pipe is a high-density, non-oxygen barrier, cross-link pipe, rated for temperatures to 180°F at 100 psi. Note that the color has changed from green to red. High-density, oxygen barrier, cross-link pipe. Rated for temperatures to 180°F at 100 psi. Excellent for radiant floor heating applications. Central PEX 1" Pipe is a high-density, non-oxygen barrier, cross-link pipe, rated for temperatures to 180°F at 100 psi. Note that the color has changed from green to red. Useful when uncoiling and installing 1/2" tubing. ThermoPEX with 25mm PEX piping is more flexible and easier to haul and ship. It's ideal for shorter runs and for the do-it-yourselfers. This product is shippable, call us for a shipping quote. ThermoPEX with 25mm PEX piping is more flexible and easier to haul and ship. It's ideal for shorter runs and for the do-it-yourselfers. ThermoPEX with 25mm PEX piping is more flexible and easier to haul and ship. It's ideal for shorter runs and for the do-it-yourselfers. This length is UPS shippable, call us for a shipping quote. Note: 1-1/4" is the inside diameter of the encased PEX lines. ThermoPEX is flexible, pre-insulated piping consisting of two waterproof oxygen barrier PEX lines (supply and return) protected by polyurethane closed cell foam insulation and a thick, durable, waterproof polyethylene outer jacket. The Central Boiler-specific corrugated outer shell allows for tighter turns. It is the ideal insulated piping for use with outdoor wood furnaces. Note: 1-1/4" is the inside diameter of the encased PEX lines.